Today’s Boston Globe has a story about the Downeaster Amtrak service between Boston and Portland, Maine. The Downeaster is Amtrak’s fastest growing rail line, with ridership increasing this year 36.7%, compared to a 17.5% average for Amtrak’s other so-called short-distance routes, and 10.3% for Amtrak’s long-distance routes. Commuters make up about a third of the train’s passengers. The state of Maine, which contributes $1.5 million to the line’s $13.5 million annual budget views the train as an economic engine for the state, allowing commuters to live in Maine and drawing vacationers up from southern New England (the federal government provides a $6 million subsidy to the service, ticket sales make up the remaining $6 million, Massachusetts and New Hampshire provide no subsidies). The state of Maine is currently planning a northward extension from Portland to Brunswick to serve more vacationers and daytrippers. As successful as the line is, the federal subsidy runs out in July, Maine Governor Balducci has proposed $8 million in next year’s state budget to make up for the subsidy loss, and the rail authority plans a fare increase. In the comments section to the article published on Boston.com, one commuter from Maine points out why he takes the Concord Trailways bus rather than the Downeaster. His reasoning boils down to cost and time. One-way service on the Downeaster costs $24 (there are discounts for booking early or if you by a multi-ride pass), one-way service between Boston and Portland on Concord Trailways is $8. The bus ride takes slightly under 2 hours (dependent on traffic and weather conditions) and the Downeaster takes 2 hours 30 minutes. And there you have the problem with transit in New England. We have short distances, high population density, and a population that is willing to leave their cars at home when there is a viable option, our options are just not terribly viable. Currently the Downeaster’s top speed is 79 miles per hour, frequent station stops, at grade crossings, and areas where the tracks cannot support that speed mean the Downeaster’s average speed between Boston and Portland is 45 miles per hour. Trains can and do move faster, France’s TGV travels up to 200 miles per hour in regular commercial use (average speed is 173 miles per hour). 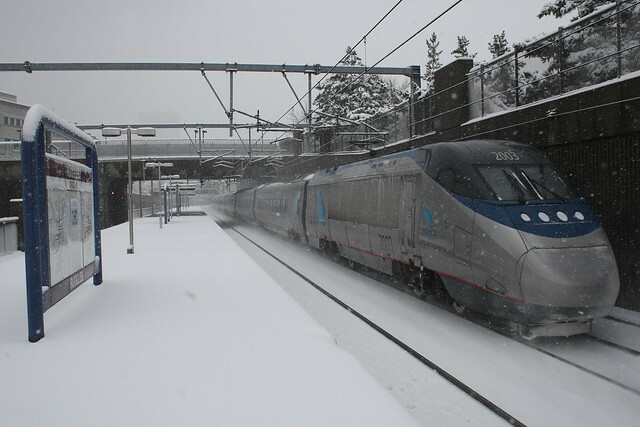 Even if the Downeaster’s average speed was boosted just to the paltry “high speed” levels of Amtrak’s Acela (average speed of 86 miles per hour), Downeaster would start to be the obvious choice over driving or the bus. However, there are still gaps. Try taking the train from Providence to Portland. Seems a reasonable request, right? In order to ride the rails between here and there takes two transfers. Amtrak or MBTA Commuter Rail to Boston Back Bay Station, orange line subway to North Station, then Amtrak to Maine. Or, you could just spend 2 hours and 48 minutes in the comfort of your own car driving there rather then rushing from train to train to train. Let’s try another, Providence to Cape Cod. Kennedy Plaza to Hyannis via Peter Pan Bus Lines is 2 hours and 25 minutes and $30.00 one-way. According to Google Maps it should take 1 hour and 26 minutes to drive that (personal experience says it can be safely done in just over an hour, holiday/weekend traffic can make it upwards of 4 hours, but the bus sits in that traffic too). Considering a round-trip for two costs $120.00 and the travel time is atrocious, it is cheaper and saner for me to rent a car to visit my family down there, if I owned a car already I’d be kookoo bananas to leave it at home and take the bus. Providence to Hartford? 75 miles, a 1 hour and 32 minute drive… 3 hours and 50 minutes on the bus! Providence to New Bedford? 30 miles, 35 minutes to drive… 1 hour and 20 minutes on the bus (ridiculously, the bus from Kennedy Plaza goes up to the bus yard off North Main, then back south and out to New Bedford). Living car-free as I do, I could go on. Oh hell, one more: Kennedy Plaza to Rhode Island Mall, 10 miles 14 minutes by car… 46 minutes via RIPTA. So what do we do? We take advantage of this moment in history. In January we will have a new administration in Washington looking to boost the economy, invest in cities, reduce our reliance on foreign oil, and improve our environment. Transit investments in New England touch on all those goals. We take advantage of our political capital, all but one or New England’s counties (Penobscot County in northern Maine) voted blue last week. Our Governors, Senators (Republican and Democrat), and Representatives have to stop with the provincialism and come together to work on what’s best for the region, not just their own states and districts. We have to stop with the tax breaks to poach businesses from each other and set ourselves up, as a region, to be competitive nationally and globally. Jef, amazing breakdown and analysis. I seriously think you should edit this down and submit this to the Globe as an editorial. Maybe even the NY Times. It’s timely and painfully honest. I would not be surprised if direct service on Megabus begins through New England at some point. They run direct service through various cities n the East coast and just recently added service to the major cities in NY. I’m just guessing that New England might be next in ine for their expansion plans. If you book in advance, tickets are as low as $1 each way, which is pretty good..
Jef, your points are very well taken, and thanks for the detailed analysis. I will say this, however, just as partial mitigation. The train is much more pleasant to ride than the bus. It also rarely gets stuck in traffic. These can be major factors in deciding whether to go by train or bus. But again, your points are very well taken, and I’d be very interested in putting together a matrix for comparison, with analysis. Oh I agree, I’m all about the train. But when you’re using it daily, and the bus is a third the price of the train, I could see myself opting for the bus.